In the previous tutorial we learnt that when we pack Tkinter objects, the order in which we pack them affects how they are displayed in the GUI. We used a Text widget to enable the user to edit text in the GUI. We also learnt to use a Frame widget to help with the layout of our GUI. In particular, we put a Label and a Text widget together into one Frame, and put an ok and cancel Button into another. For homework you needed to get data from the Text widget. In order to display all of the configuration options we are going to go a bit nutty using Frames. We will eventually (but not today) use one Frame to hold all of the configuration options, and another Frame to hold the Ok and Cancel buttons. But that’s not all! We will also use a Frame to house each configuration option (ie key and value pair). 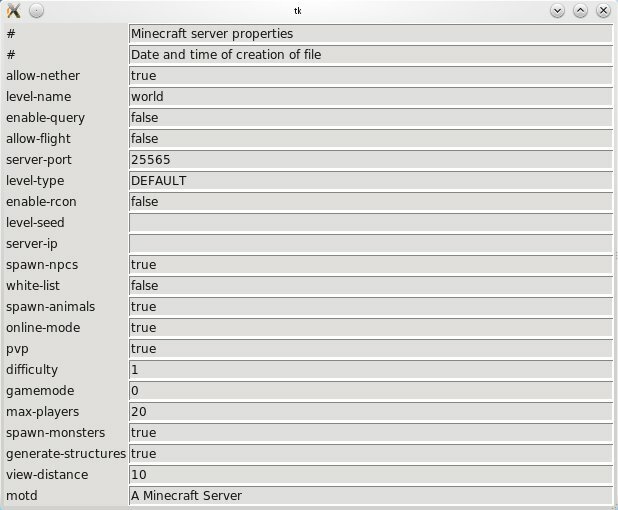 Before we do that though, we need to remember where we were up to reading and parsing the server.properties file. * closes the server.properties file. # now check to see whether the config item takes only the values "true" and "false"
created a frame in which to pack each of these. instead of the first line ending “(object):” like the other classes we’ve seen, this one ends “(configItem):”. This means that guiConfigItem’s immediate parent is configItem. However, since configItem is based on object, in the end, so is guiConfigItem. it starts by creating a Frame, stores it in self.frame, then, inside the frame, it creates a label and an Entry widget. An Entry widget is the single line version of the Text widget we used last time, and it should be good enough for our purposes. you can tell that the Label and Entry widgets are created inside the frame which has been created because the first parameter passed to them is self.frame. Wow, is that magic? The way we defined the class meant that each of the instances packed itself for us as we created them. This is an example of why using classes can be so much fun. Exercise: how might you do the same thing without using classes? Exercise: confirm that you can edit the values on the right. Exercise 2: check through our docstring to see what we’ve done so far and what we’ve got left to do. The complete source code with the final edit is below. “Class inheritance” is one of the best anti-patterns ever. Don’t teach [class inheritance] to the kids. I have to agree with Bilbo here, you will loose your target audience to the dark side, In fact I’ve been using Python for 2 years, and C++ for 22, and you’ve lost me as target audience as well. To keep to the origional topic, you will need to tighten up and focus on 8-16 year olds, all of your projct ideas are awesome, the implementations however imply concepts above most 16 year-olds; anyone older than 16 is no longer a kid. I don’t have a strong view on class inheritance, although I did review the issues to do with the debate. Overall, my reading of the debate was that class inheritance is not considered evil in Python, esp given its mixins and that it is more of a problem in single inheritance structures like Java.